A sensible alternative to raw diets. 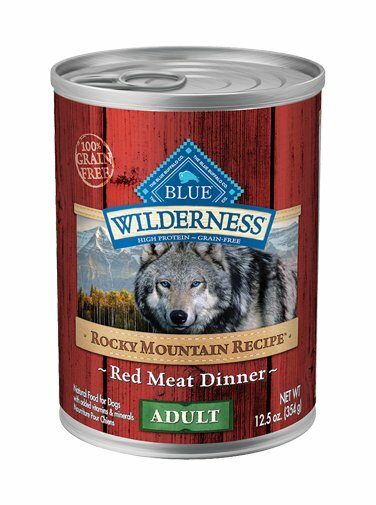 Raw diets are less convenient to prepare than BLUE Wilderness. What's more, with raw diets you typically need to provide additional supplements to ensure what you're feeding your dog is nutritionally complete. Beef, Beef Broth, Turkey, Lamb, Peas, Potatoes, Flaxseed (source of Omega 3 and 6 Fatty Acids), Carrageenan, Cassia, Guar Gum, Potassium Chloride, Salt, Choline Chloride, Zinc Amino Acid Chelate, Iron Amino Acid Chelate, Vitamin E Supplement, Copper Amino Acid Chelate, Manganese Amino Acid Chelate, Sodium Selenite, Thiamine Mononitrate (Vitamin B1), Cobalt Amino Acid Chelate, Niacin Supplement (Vitamin B3), Calcium Pantothenate (Vitamin B5), Vitamin A Supplement, Riboflavin Supplement (Vitamin B2), Biotin (Vitamin B7), Vitamin B12 Supplement, Potassium Iodide, Pyridoxine Hydrochloride (Vitamin B6), Vitamin D3 Supplement, Folic Acid (Vitamin B9).